Vintage Original 1935 MCF Motorcycle Poster by Geo Ham Litho. 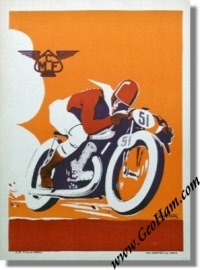 Vintage original litho, designed by Geo Ham for the "Motocycle Club de France" and printed in 1935. It measures some 30 x 40 cm or 11.75 x 16 inches and it was printed by Max. Courteau Imp. Paris, France.